My name is Christy Snow. I'm seventeen and I'm about to die. I'm buried in a coffin under tons of concrete. No one knows where I am. My heart sounds like a monster with clobber feet, running straight toward me. I'm lying on my back, soaked with sweat from the hair on my head to the soles of my feet. My hands and feet won't stop shaking. Some will say that I'm not really here. Some will say I'm delusional. Some will say that I don't even exist. But who are they? I'm the one buried in a grave. My name is Christy Snow. I'm seventeen and I'm about to die. First in the newest series from Ted Dekker, a master of suspense, whose books have sold 9 million copies, Eyes Wide Open is a raw adrenaline rush from the first page to the last. Eyes Wide Open by Ted Dekker is a compilation of what was originally a 4 part novel now joined together. The original four parts include: I. Identity; II. Mirrors; III. Seer; and IV. Unseen. In this novel two teens Christy Snow and Austin Hartt are mistakenly/maliciously imprisoned in a psychiatric ward. The procedures for admitting patients to this psych ward are unconventional, as are the treatments that patients must undergo. Both Christy and Austin are in danger of losing track of who they really are. This is a fast paced, tension filled novel that is a quick and easy read. Since it is by Ted Dekker there are also Christian elements embedded in the story and especially in the climax. 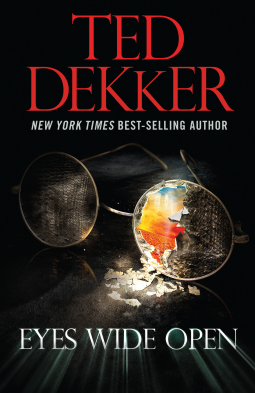 I have enjoyed immensely several novels by Dekker in the past and had high hopes for this novel. Unfortunately, while I did enjoy the novel, I'm going to have to admit that I simply couldn't suspend disbelief and overlook several facts presented right at the start. Both Christy and Austin are 17 year old orphans. They can't remember their lives before age 13 when they entered the orphanage. Both have a trust fund that gives them $2,000 a month, starting when they turned 17. Gulp. Perhaps it is because I am an adult with adult children, but I simply can't accept these facts about these characters, and make the novel work for me. I have a suspicion that Eyes Wide Open would work much more successfully as a YA novel with its worthwhile message concerning self-esteem. Even with the message, the characters weren't hitting the mark for me which lessened my enjoyment of the novel. A So-so novel. I've enjoyed many of Dekker's other books much more. Eyes Wide Open is the start of a new series of novels by Ted Dekker called the Outlaw Chronicles. Disclosure: My Kindle edition was courtesy of Worthy Publishing via Netgalley for review purposes.